Senator Hollings served as a Democratic Senator for the State of South Carolina from 1966 until 2005. He was born in Charleston, attended undergraduate studies at The Citadel and earned his law degree from the University of South Carolina. 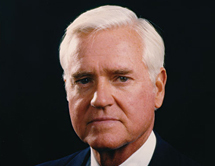 Prior to serving in the U.S. Senate, Mr. Hollings worked to improve education and employment opportunities as South Carolina’s 106th Governor. Now retired, Mr. Hollings writes frequently for The Huffington Post. He also started the Hollings Scholarship in 2005, which allows over 100 undergraduates throughout the nation to intern with NOAA as well as provides monetary scholarship during the school year.